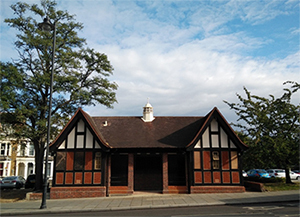 Located in the Tottenham Green Conservation Area, the former public toilet at the junction of Tottenham High Road and Monument Way is a much loved local landmark in Tottenham. Following consultation with the local community and an architectural study of the building, Haringey Council invited Expressions of Interest from prospective tenants to lease the building as a bar/café, bringing new life to this historic structure and enlivening this part of Tottenham High Road. Returning this building to use for the Tottenham community is part of an ongoing series of investments through the Tottenham Regeneration Programme. The new bar/cafe is called The High Cross run by Chris Johnson and Alex Beeston. They were suported by Haringey Council's Opportunity Investment Fund - a loan fund for businesses. Find out more about how the Fund supported them here. For all the latest updates and what's on follow the High Cross on instagram (external link).